The Financing In-Home Asthma Care microsite within ACN.org focuses on delivering and paying for in-home asthma care to improve outcomes for children with out of control asthma. Health care policy change is creating new opportunities for financing evidence-based in-home asthma care. This site explores those opportunities and the work required to deliver effective and sustainable in-home asthma care. U.S. EPA and our partners, the Departments of Health and Human Services (HHS) and Housing and Urban Development (HUD), among others, are coordinating federal efforts on asthma as is described in the Coordinated Federal Action Plan to Reduce Asthma Disparities. This microsite, which consolidates information about financing in-home asthma care in order to deliver effective care, particularly in underserved communities, is one example of our effort. We will update this content regularly. To be notified when new information is posted on this site, please subscribe to this site by checking the box for "Subscribe to this Page" below. In-home care can reduce the costs of care and improve health outcomes for people with poorly controlled asthma. Health policy change has created many options for financing in-home asthma care. Programs need to articulate the value their in-home asthma care services can deliver to the community, funders and partners. Training staff in evidence-based in-home asthma care is critical. 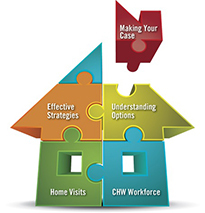 Community health workers (CHWs), who provide culturally appropriate, family-based care, are good candidates. Effective efforts have followed common strategies to secure Medicaid coverage for in-home asthma care. Created by the National Center for Healthy Housing in partnership with EPA, this new eLearning and technical assistance platform equips participants with information about how to build the systems, infrastructure and financing to put home-based asthma services in place in their own states, communities or regions. Click on the icon to access the eLearning modules.